Today we are thrilled to host Supriya Kelkar, author of AHIMSA, recipient of an ALA Booklist starred review, a School Library Journal starred review, and winner of the New Visions Award, a middle-grade novel that takes place in 1940s India, an era of great change as Indian citizens fight for independence from British colonial rule. When ten-year-old Anjali’s mother announces that she has quit her job to become a Freedom Fighter following Mahatma Gandhi, Anjali must find her place in a rapidly changing world. AHIMSA will be published by Tu Books (October 2, 2017). Be sure to stay tuned for the giveaway at the bottom of the post! My journey to publication was less like a quick Waze-navigated journey, smoothly avoiding road blocks and back-ups, and more like a road-trip with my young kids, full of constant stops and a few tears, taking twice as long as I expected. Back in 2003, while working on the writing team for an Indian production company, I couldn’t get my great-grandmother’s story out of my head. She was an Indian freedom fighter who worked with Mahatma Gandhi, spent time in jail for her participation in the non-violent civil disobedience movement, was told she would be freed if she would just apologize to the government but refused, and later went on to become a two-term congresswoman post-independence. It was a story full of persistence and resistance featuring a strong female character, and I was certain it would make a great screenplay. With my great-grandmother’s biography in hand, I set to work on the script, ready to make an award-winning Bollywood biopic. The only problem was, I just could not figure the story out. So I rethought the plan to write a biopic and instead settled on the idea of fictionalizing the story, thinking it might work better if the protagonist was the privileged daughter of the freedom fighter, rather than the freedom fighter, herself. But despite all my research and effort, I still could not get the story to work. That’s when I had the brilliant idea to write the script as a novel. I thought it would be a quick and easy way to delve deeper into the story, figure out the beats, and put them back into script form. Clearly, I had never written a novel before, because it turned out novel-writing was neither quick nor easy, and when I was done, I had a badly written first draft of AHIMSA. It was so bad, in fact, that I decided to shelve the project, and went back to focusing on the company’s Bollywood scripts, my own scripts, and, after learning a little bit more about writing books, some more novels, which I spent years querying publishers and agents about, to no success. But every year, in between the dozens of projects and hundreds of query letters and rejections, I’d remember AHIMSA, and do a revision, adding subplots, killing off characters, year after year after year, until I finally got it to a good place in 2015, more than a decade after starting. And that’s when I heard about Tu Books’ New Visions Award. I entered the competition, found out AHIMSA had won in 2016, and after a year of edits, fourteen years after I wrote the first draft, AHIMSA was finally a real book. Looking back on the journey, would I have preferred the smooth, quick route? Absolutely. But all that extra time didn’t hurt me, as I thought it had in the moment. Instead, it helped me grow as a writer, helped me learn more about craft, and helped me toughen up to rejection and understand that criticism isn’t something to take personally and get defensive over, but rather, is something to use to improve your work. So while the quick and easy way is usually my preferred route to travel, in the end, I’m glad my journey was full of bumps and pit stops. Just remind me of that mantra the next time I’m on a family road trip that takes eight hours to get to Chicago instead of four. Born and raised in the Midwest, Supriya learned Hindi as a child by watching three Hindi movies a week. 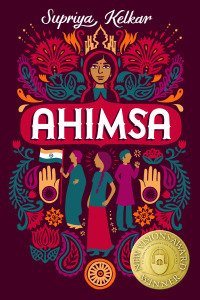 Winner of the 2015 New Visions Award for her middle grade novel AHIMSA, (October 2, 2017), Supriya is an author and screenwriter who has worked on the writing teams for several Hindi films, including Lage Raho Munnabhai and Eklavya: The Royal Guard, India’s entry into the 2007 Academy Awards. She was an associate producer on the Hollywood feature, Broken Horses. 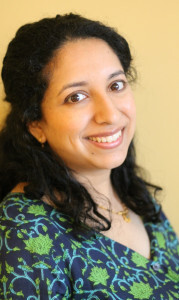 Supriya is represented by Kathleen Rushall at the Andrea Brown Literary Agency. I still remember my first acceptance letter for a short story I'd written. I'd been so used to rejection letters that I couldn't believe it when I saw a check for $30 instead of "We're sorry, but your story isn't right for our publication." I have the letter (and a copy of the check) framed in my office. Hi Supriya! Thank you for sharing your writing journey. An agent recently connected with my Indian voice and asked for more work. It's nice to receive positive motivation to continue writing. I enjoyed reading the back story on how this book came to be. Thank you for sharing the journey! Looking forward to reading it! Thank you for sharing your writing journey, Supriya! I can remember when I won a writing contest When I was 12 and my story was read during the morning announcements. I had to imagine what it would be like to be related to someone on the Challenger Space Shuttle and how I would feel if I lost someone in the explosion.